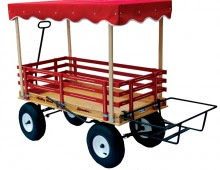 Amish Wagon Works: New Wagon Accessory! This beautiful Surrey Top is sure to add a touch of elegance to your Valley Road Wagon. Perfect for parades, parties, or just to keep the sun off while playing in the yard! Unlike our previous Surrey Top, this top is easy to clean, and comes in red, blue and green, with a white fringe accent. The Surrey Top also comes in three different sizes, small, medium, and large, which fit seven different Valley Road Wagon Models. Side posts and brackets are included.